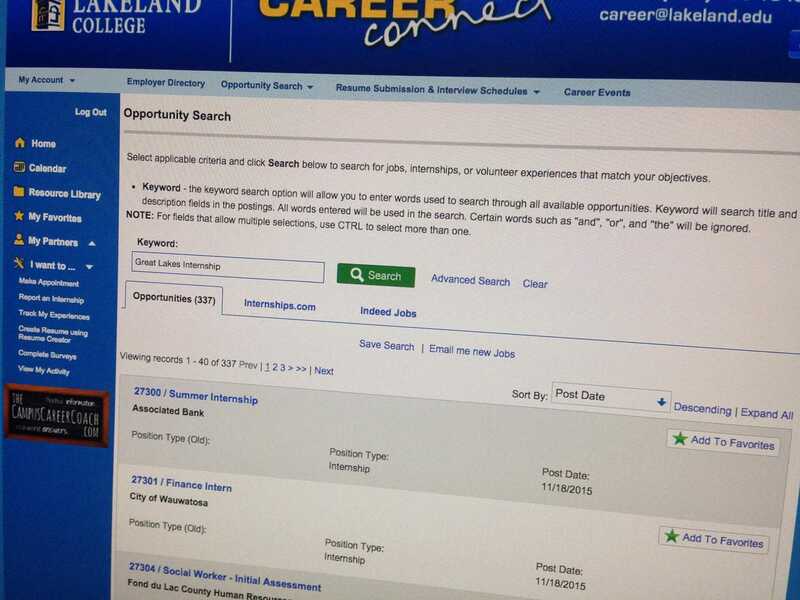 Students can find potential Great Lakes Internship positions on Career Connect. The first informational meeting concerning the 2015-2018 Great Lakes Career Ready Internship Grant was held on Thursday, Nov. 12. Several students were in attendance as Student Success and Engagement Coach Rick Herian explained more about the grant. The grant, which was awarded to 33 institutions in Iowa, Minnesota, Ohio and Wisconsin, will allow for 249 new internships to be created and funded over the next two years. Through the grant program, students will now have not only more internship opportunities, but also will now be paid for being interns in positions they may have not previously had access to or been paid for before. Herian explained the criteria for which a student would qualify for the grant program: a student must be of junior or senior standing; the internship must be related to their academic major; a student must have a minimum of a 2.5 GPA; students must perform 150 hours, which equals 3 credit hours; and the internship must be secured through Career Connect. Students’ eligibility also is limited to those who submit the FAFSA for that academic year and to students who have a financial need, meaning their government aid provided does not fully cover their tuition. Requirements for the employers hosting these internships include that the position must be one that is either new or one that has not previously been a paid internship. The grant “includes all semesters, summer, spring and fall,” said Herian, and that there are “opportunities beyond the Sheboygan area.” This allows for students to potentially take advantage of this grant opportunity if they go back home in the summer, even if they live out of state. Unfortunately, this is limiting to international students. They are not eligible for the grant due to the fact they do not fill out the FAFSA and these internships are must be located within the United States. This does not limit them from having internships, only from getting paid in a previously unpaid position through the grant. Flexibility on some of these criteria, like if less 150 hours is available through an employer or what exactly constitutes an ‘new internship,’ may be possible in special circumstances. Students are advised to seek out their success coach in such matters. Herian added, the grant will work “to create lasting relationships with area employers” so that internships with new companies will continue beyond the grant timeline. The hope is that future internships through these companies will not only be available, but become paid ones by the companies themselves. For more information, contact your success coach or Lakeland’s Internship Grant Coordinator Lucas Dulmes, located in the success front office. An additional meeting to learn more about the internship grant opportunities will be held on Thursday, Nov. 19 at 5 p.m. in Laun 228.